Family Fun Things To Do in Gettysburg! What is the most interesting historical place you had been? A trip to a famous historical site is a great bonding activity for friends and family members. Choosing the perfect destination for your next family trip is important because it will help create that once in a lifetime experience that everyone will remember for a long time. Visiting Gettysburg, Pennsylvania can be a trip of a lifetime or an easy weekend getaway. Gettysburg, Pennsylvania has become a popular choice among local and foreign tourists not only because of its rich history but also because of the fun things to do and exciting attractions to visit that are suitable for people of all ages. The Gettysburg National Military Park is a must see tourist destination not only for history buffs but for everyone who would like to have a deeper understanding of the Battle of Gettysburg. The park honors the hallowed grounds where soldiers gallantly fought and died in the Civil War. There is an orientation program for first time park visitors which will allow them to understand what they are about to see and experience. The David Wills House is primarily a museum that tells the story of Mr. David Wills who had a major role in creating the Soldiers' National Cemetery and in leading the cleanup of Gettysburg in the aftermath of the dramatic and historic 3-day battle. Visitors will also learn more about President Abraham Lincoln’s visit and the inspiring and moving speech known as The Gettysburg Address. Aside from being an ideal destination for history aficionados, Gettysburg is also ideal for shoppers, outdoor enthusiasts and antique collectors. 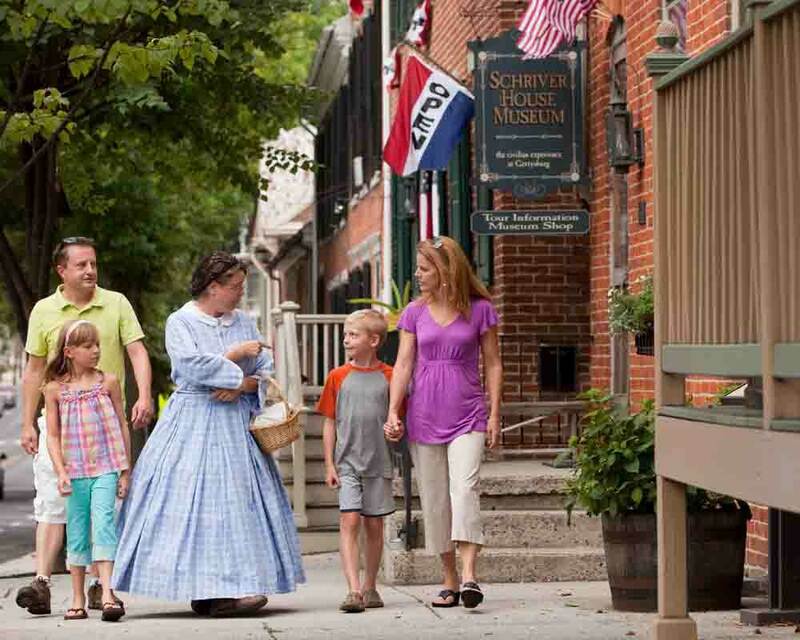 A stroll along the streets of Gettysburg will introduce you to the many eclectic shops that offer unique products and gift items, Civil war artifacts, home décor, jewelry and souvenir items. If you are looking to purchase handcrafted gift items, art prints and collectibles, there are galleries and heritage centers that you can visit. There are also publishing houses and book shops that offer an extensive collection of books such as books on the American Revolution and the American Civil War. Not to mention, Gettysburg is the perfect destination for families and friends looking for a distinct dining experience. From historic taverns that serve ethnic cuisine to inns and restaurants that are perfect for casual dining, family buffets and farm to table dining, having an extraordinary dining experience every time you eat out is possible. For family fun and entertainment, there are performing arts centers and theaters where you can watch shows by orchestras and bands and enjoy performances of artists from different genres such as Motown, Broadway, pop, and jazz. There are also children’s shows that your little ones will surely enjoy. For the outdoors enthusiasts, you can explore the wildlife preserves, zoos and farm parks and participate in various fun and exciting activities suitable for the whole family. Gettysburg, Pennsylvania is the ideal travel destination for everyone. You can even choose from the different travel packages that they offer, each made for different types of budget, to help you create that dream vacation that you and your loved ones deserve. You might want to check out their unique festivals, fairs, exhibits, theater, & concerts. Like them on Facebook or follow them on Twitter for updates and promotions. This post is sponsored by Destination Gettysburg. I have been wanting to go there for a long time. I love the history in this area. Gettysburg is a great city to explore with the family. My family went there a couple of times when I was a kid, and we always had a good time. We were gonna drop by at this last year but we didn't have enough time. I love historical places like this. I lived in PA as a child and have always wanted to go back to visit. I'd love to start with Gettysburg, Pennsylvania. There's so much to do.